In 1992, Pastor Leonardo Stewart, While on a short term mission trip to Russia with Pastor Maynard Weisbroad was given a vision to start a Church. 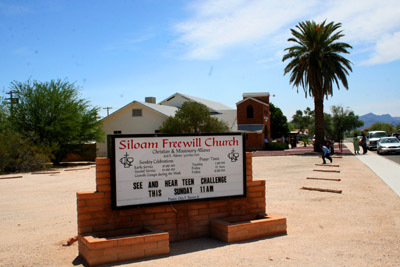 The name of the church was also given to him at the time, It would be named Siloam Freewill Church. Siloam interpreted mean "Sent" from the scripture in John 9:7 where Jesus told the blind man to go wash in the pool of Siloam. Pastor Steward was obedient to what God had asked him to do. Once back in Tucson from Russia he started working on fulfilling his vision. Pastor Larry Rice, Pastor of the Church of God at 5665 E 29th St. was gracious in allowing Pastor Stewart to use the facility, so on February 14th 1993 at 1:30 pm in the afternoon, Pastor Stewart fulfilled his vision with 13 people in attendance. In August 1993, Siloam was blessed to move into small Church building at 1702 S. Winmore Street. Within a year or two the congregation grew to approximately 60-70 members, so at that time we had outgrown the facility. Pastor Stewart started looking at different building within the local community and eventually was lead to this building originally called First Alliance Church at 628 E. Adams Street, owned by the Christian and Missionary Alliance. After reaching an agreement with the C & MA. The building was rented for $450 a month. The first service was held here on the first Sunday in January 1995. In August 1996 Pastor Stewart left for Cleveland, Ohio to plant a church there. Siloam went through a difficult time without a Pastor, but during that transition time God was faithful. On December 15, 1996 Siloam was blessed to hear Pastor Otis F. Brown Jr. delivered his first sermon as Pastor of Siloam with about 30 in attendance. Presently we have approximately 125 members. In 1997 on August 9th, Pastor Otis Brown and Sis. Lendor Marks were united in marriage. On November 18 1998 Pastor Brown completed the process of incorporating the church in Arizona. In May of 1998 God made a way for Siloam to purchase the church from the C & MA for $200,000. Over the years there has been numerous physical improvements and construction projects by Pastor Brown, a retired carpenter of 31 years and 2 years as a contractor. Improvements such as a, sound booth, ceiling fans, lighted marquee sign, valance light in the sanctuary, the grass was stripped out and replaced with purple rocks. Air conditioned was installed on the south side of the building and in 2017 the AC was installed on the north side. The nursery was remodeled and church van was purchased. In 2005 a basketball court was put in on the west lot and financed by the Joe Shafe Family. The tiling of the entry and fellowship hall was financed by Pastor Brown's sister, Rita Brown of Portland, OR. Pastor Brown remodeled a room know as our Prayer Room, strictly for prayer, painted in white and gold with a kneeling altar. Siloam is now in its sixth year of feeding the homeless and opening its cloth room every Friday. 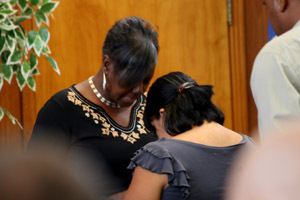 In 2007 Siloam went to two services on Sunday Morning, 9AM & 11AM. Pastor Brown is also a Chaplain at the Pima County Jail and has represented Siloam for some 18 years. The church has also ministered as the Wilmot prison many times. Siloam has produced and trained many Deacons and Ministers throughout the years 8 Deacons and 8 deaconess. 14 licensed Ministers, 3 Ordained Minister. Approximately 30 official workers in the Kingdom of God. Many of whom are spread around the city and country. One of our ministers, Pastor Mike Farlin is currently pasturing at Alliance Bible Church in our city. Siloam was among the first African American Churches in our Community to make the bass guitar a standard in the services. Also one of the first to use a projector to show its songs. The first church to have a full fledge Fitness Center on its property. First Black Church to hold a Spanish services once a month for a year. 1. In 2002 Siloam and a few local Churches helped to sponsor Pastor Otis Brown on a mission trip to Haiti to help train young Haitian Pastors. 2. In 2007 Siloam began its Growth Group Ministry and the idea of Sunday School on Sundays was transitioned into growth groups for the whole family on Wednesday. Siloam now has six Growth Groups during the Week. 3. In 2013 A contractor that was creating Fraternity locations for the U of A financed 85% of the new parking lot on the east side of the church. It was named the "Jarett Reidhead parking lot in honor of the contractor. The parking lot was dedicated on May 2nd, 2013. 4. That same year Pastor Brown installed a paver sidewalk between the new parking lot and the church. 5. In 2013 Siloam began Live Streaming on its Sunday Morning 11am service. This has allowed Siloam to be heard around the world! 6 In November of 2013, Siloam make the last payment on its property and was sent the original note saying "Paid in Full, Your Balance is 0.00- Praise God! 7. In April of 2016 a large section of the educational building was remodeled and Siloam Teen Church was launched on Easter with 40 youth in attendance. God has provided faithful workers while STC is still praying for a Youth Pastor. 8. On May 21st 2017 Siloam Freewill Church's name was officially changed to Siloam Christian Church. Siloam story is not finish yet. Today everyone here is a part of the next Chapter. The best is yet to come! Praise God! "Building the Kingdom One Soul at a Time!" We have four major doctrines that we avidly believe and teach. The vision of Siloam is as follows. To Reach the World for Christ. Build Believers through Fellowship and Growth Groups. Train and Equip the Workers to win the Lost and Care for the Believers. Siloam Christian vision is to touch and impact the lives of our local and global community as a large ethnicity and culturally diverse Cell church; meeting the needs of the whole person through spiritual an social avenues. Our teaching, preaching, outreaches and programs all center around our purpose and Vision statements. Touching people so they can receive from God. We must touch people! Peter's mother in-law was healed (Matt. 8:15) when Jesus touched her. The woman with the issue of blood (Matt. 9:20-21) was healed of a long term illness when she touched the Son of God. People today know that they need to be touched, but what they don't know is, who can I touch. Someone once said, 'People don't care what you know until they know that you care'. We identity with the concerns of the communities to whom we are sent to bring health and healing. Jesus was moved with compassion when he saw the sick, downtrodden, the discourages (Matt. 9:35-38). Compassion is care enough to take action. In our society today, concerns vary from community to community, but we must make it known that we are aware of the 'real issues' that affect our city today! Families are fighting for their lives. Many are struggling to make ends meet. Children need to be able to get the benefits of a great education without the threats of gang violence. These are the concerns of our city! The church is responsible to address these issues and proclaim our God as the answer! We must tell the world that God is aware of the plight of humanity, and that He has established the church as "His agency of change and restoration! ".